ONETRACK is a dynamic and multi-functional video analysis program that works with a PTZ camera in order to automatically track an approach to a building or a property. Algorithms help to greatly reduce false detections caused by different exterior phenomenon (wind in the trees) as well as by non-significant objects (reflections, banners blowing in the wind and small animals). The images of the scene may be viewed locally or remotely in real-time or time-shifted via a computer. In MultiTrack mode, fixed cameras are used to detect significant objects and PTZ cameras are guided to track large objects close-up. Pursuit priorities may be assigned according to the type of object and zone. A PTZ can work with a maximum of 15 fixed cameras in order to monitor a large exterior surface area. Installing PTZ cameras at the corners of a building makes it easy to provide effective videosurveillance of the surrounding areas. The zoom capability of PTZ cameras provides sufficient detail to recognise a person more than 75 metres away. 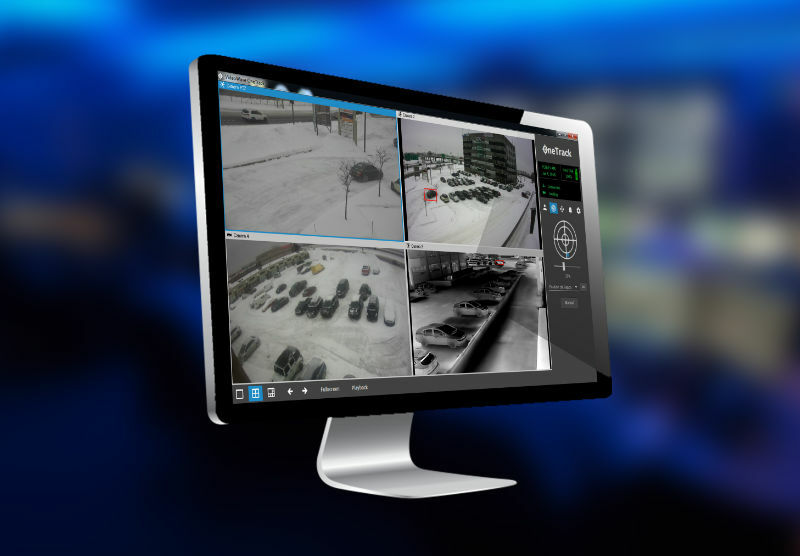 The detection and tracking capability of ONETRACK enables a PTZ camera’s zoom function to be kept continually positioned on where the action is happening. In addition to detecting and classifying moving objects, ONETRACK use video analytics to enhance the reliability of detection via a remote monitoring centre. Onetrack Server Lite Pro Ent. Surveillance cameras must be installed at a minimum height of 4.5m. Analytical fixed cameras must be installed close to PTZ cameras in a Multitrack environment, and must have relatively the same field of view. To optimise tracking capability, a PTZ camera should preferably be installed at the corner of a building, to offer the widest possible coverage of the surveillance zone. Avoid installing a fixed camera facing in a direction opposite to the PTZ camera, or even at 90° to the PTZ. This would negatively impact the tracking of moving objects. When using IP HD cameras, opt for “SMART MANAGED” Gigabit POE switches (ie: network switches) to facilitate IP traffic management. SORHIP thermal cameras can secure a perimeter regardless of weather both day and night. Thermal cameras capture images based on the heat emitted by persons and objects. Thermal cameras permit perfect vision in total darkness. Advanced video intelligence solution permits detection of different types of moving objects via a SORHIP thermal camera / thermal detector. The analysis classifies moving objects into 3 types (person, vehicle, other) as needed. The PTZ camera automatically tracks and zooms on objects detected by the SORHIP thermal camera / thermal detector to facilitate identification of persons and vehicles. SORHIP thermal cameras / thermal detectors detect objects of interest and control the PTZ cameras for close-up tracking. Tracking priorities can be assigned based on type of object and detection zone. A PTZ camera can work in conjunction with up to 7 fixed cameras. SORHIP thermal cameras / thermal detectors can monitor a large outdoor area. Image analysis technology extracts the information contained in an image objectively, precisely and often automatically. Video analysis augments detection reliability in situations of remote surveillance from a monitoring centre. Filters and functions reject false positives caused by reflections, waving trees, and other extraneous phenomena. Special functions can designate verification zones for close-up car number-plate recognition and face recognition in traffic areas.